Leverage the power of swift ecommerce and over a million buyers by selling on Amazon India and shipping with Shiprocket! Sync your orders directly into the panel and ship them in a few clicks with the courier partner of your choice! Selling to an International market with Amazon? You can sell on Amazon US/UK, integrate your account with Shiprocket and ship using top courier partners like FedEx, Aramex, and DHL. Now ship to 220+ countries across the world while you sell on top platforms. 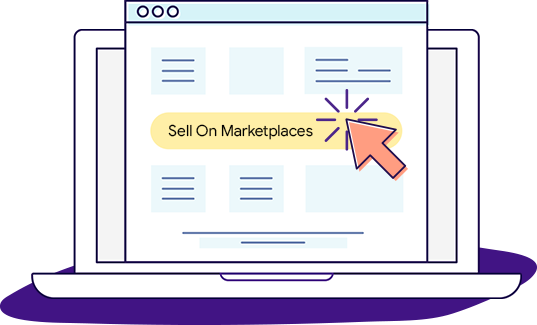 Ship overseas with Shiprocket while you sell on powerful platforms like eBay. Sync your eBay US/UK account with Shiprocket and ship seamlessly to over 220 countries across the globe through a single platform. Ship to your buyers across India and abroad while you sell using Shopify. Integrate your Shopify website with Shiprocket and begin creating, processing and tracking forward and return orders, assign AWB number, and print shipping labels for all your orders and start sending couriers via your preferred carrier partner. Magento is one of the best eCommerce platforms for building an eCommerce website. If you use Magento or Magento V2 for eCommerce, then there is no better platform than Shiprocket for shipping your orders to customers. Use the multiple features offered by Shiprocket and reach to 26000+ pin codes across India. Opencart is one of the most widely used, PHP based, online store management platforms. Easily integrate your Opencart eCommerce website with Shiprocket and start shipping to a vast audience at rates starting at Rs. 27/ 500g. Along with discounted prices, you can also automatically sync orders into the platform. Sell on your WooCommerce store and send shipments using Shiprocket, India’s best eCommerce shipping solution. Integrate your WooCommerce store with Shiprocket in a few simple steps and start shipping to your customers using the best courier partners at discounted rates. Unicommerce provides automated solutions for eCommerce sellers. There is no better shipping platform to complement unicommerce than Shiprocket. With fully automated workflows, Shiprocket gives you a chance to fetch orders directly from your site and process them in easy steps. Whether you want to send a single shipment from your Prestashop store or have thousands of products to be delivered, you can trust the Shiprocket-Prestashop integration for seamless shipping. With this integration, you can print bulk shipping labels, manage your orders and start generating pickups daily. An eCommerce giant, Bigcommerce is known for its versatility. With the Shiprocket integration, you can add an edge to your Bigcommerce account and process shipping for your orders within minutes. Ship to 26000+ pin codes at rates starting at Rs. 27/500g. Kartrocket is a dynamic eCommerce software platform that helps you build your online store quickly. If your web store is successfully running on Kartrocket, you can choose Shiprocket as your reliable shipping service provider to process your manage orders, handle inventory, and ship in a few clicks only.